Peak Bagging - Few places on the planet offer the diversity that Zion National Park does. Peak bagging, although not what the park is known for, is a great form of recreation and during your climb you are surrounded by some of the best scenery anywhere. Remember that sandstone can be very soft and weak in nature and even more so if it is wet. Peaks are often tantalizing but can be dangerous. 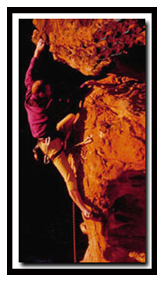 Some peaks require steep, unprotected scrambling or even 5th class maneuvers on unsure footing. It is essential that proper training, and equipment are employed on some of the descriptions given. If you feel unsure about continuing, it is better to back off, and try again at another time. Remember your safety is always your responsibility. CP in the Backcountry - If you are into peak bagging you will enjoy these books and website about peak bagging in the Zion and Las Vegas area by Courtney Purcell. Hiking - For those that want to keep their feet a little closer to the canyon floor, you can explore the diverse world of the park by hiking, backpacking, canyoneering or biking. If you have already done all the trails in Zion Canyon, be sure to explore the trails and routes located on the east side of Zion. Hiking Equipment - The kind of gear you will need for your visit to Zion National Park depends on which trails you plan to hike. Comfortable hiking shoes and quality socks are a must. Painful blisters and sore toes can ruin your plans. If hiking the Zion Narrows is on your vacation itinerary, you might want to invest in a good pair of aquatic shoes. A day pack and hydration system are also essential. Average Temperatures, Precipitation, Elevation - The floor of Zion Canyon is only 4000', so temperatures can soar in the Canyon. Leaving Zion Canyon and traveling east through the main section of the park the elevation of the park rises. Mt. Carmel Junction, on the east side of Zion National Park, is a mile high and a cool alternative for lodging. Average summer temperatures in Zion National Park range from 93 degrees in June to 97 degrees in August, but temperatures can reach 110 in Zion Canyon and the campground area. The lowest section of the park is Coal Pits Wash at 3666' and the highest is 8726' at Horse Ranch Mountain. Plan for hiking in the heat by bringing lots of water, wearing a hat and using sun screen. Photos - The bottom three photos on this page are of Bo Beck. 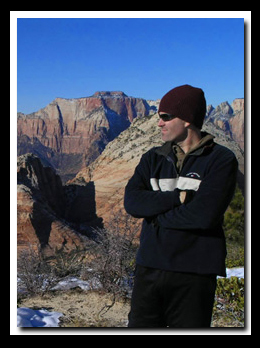 In these pages you will find insiders information on Zion National Park lodging & camping. This guide includes maps, pictures and even information on Zion's hidden treasures.